It is about some of the ideas that have underpinned the past and current work of Entelechy Arts as the company continue to explore the boundaries between art, community and everyday life. “Whenever people have the sense of being alive and wholly present to one another, we have the spirit of community. The anthropologist Turner called this process of being wholly present and alive “communitas”. Without “communitas” the cycle of daily routines and repeated acts lacks authentic energy and people cease to take care of the world because it is no longer their world” ( Hulton ed 1984, p310). 2017, Bermondsey, south London, the lounge of a nursing home for older people. There are twenty of us in the room: artists and emerging artists of all ages, residents and non-residents, professional carers and relatives. In this liminal space, identities have become blurred. The room has been transformed into a creative laboratory, part of the research and development stage for a forty-eight-hour immersive theatre work that will interrogate the question: “What makes life worth living when we are old and frail and unable to care for ourselves?” (Gwande 2014). And yet, despite the difficult life circumstances of many of the participants, despite the enormity of the question and the complex social challenges that underpin it, there is a sense of energy and excitement in the room. There is a sense of connectedness, of “communitas”. Within Turner’s space of ‘authentic energy’ relationships are deepening. The shared process of making theatre has created a space for people to grow into new possibilities of themselves. Their stories and perspectives are contributing to a wider creative process. People living in nursing homes are some of our most isolated citizens. Institutional life has served to segregate them from the web of social connections in which they were formally situated. ‘Their temporal frameworks, their ‘future that cannot be mapped out’, (has) ceased to synchronise with those of family and friends’ (Lawton 2000). Ageing is a growing concern in the UK. The number of older adults (age 65+) is set to rise to almost 25% of the population over the next 20 years (Age UK, 2013). Although people are living longer, they are not necessarily living well. Beyond the walls of the care homes there are increasing numbers of people living home alone with domiciliary care support. Many also experience chronic isolation with often negative impacts on health and well-being (e.g., feelings of loneliness, poor quality of life, development of illness; Cacioppo & Patrick, 2008; Perissinotto et al., 2012). The theatre session in the lounge is not a ‘one-off’ intervention in a ‘care setting’. 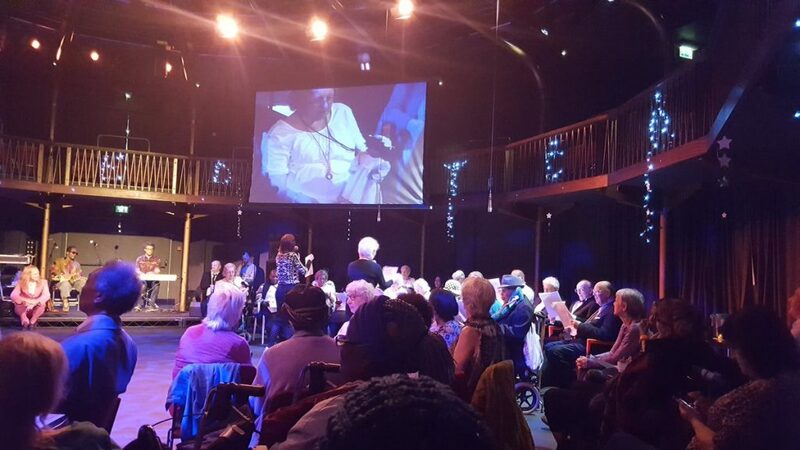 The older participants are recognised and valued members of a wider, complex, arts, relational network of people that stretches out through the walls of their institution into the neighbourhoods of south east London. Hundreds of people come together in interchangeable groupings, at different times and in different spaces to sing, dance, write, perform, and tell stories; to make theatre in a ‘quietly transformative practice’ (Heritage ed 2013) co-curated by Entelechy Arts. This work realises an ambition of the Warwick Report (University of Warwick 2015). Cultural spaces: arts centres, libraries, studios are transformed into gathering spaces, into places that give ‘us continuity, something to return to, and offer a familiarity that allows some portion of our lives to remain connected and coherent’ (Solnit 2014) Here, in the creative doing, people build tiny particles of community; particles of belonging. Within these interactional relationships people become valued and recognised as ‘individuals with biographies constructing projects that are historical in character’. (Witkin 1995). There is a fragile stitching back into time as isolated older people become recognised and valued as active and contributing citizens. This is a creation of community as a ‘largely mental construct…highly symbolised, with the consequence that its members can invest it with their selves’ (Cohen 1985) ‘I’m a different person. More able. More confident. I often wonder what’s going to happen next that I’ve never experienced before’ (Channing-Hamon 2017). The genesis of this work, now beginning to inform UK arts and cultural policy (DCMS 2016; Gulbenkian 2017) can be traced back to the ecology and pedagogy of Dartington College in the 1970s. “What if you grew up with a theatre at the end of your street?” asked Peter Hulton, one of the architects of Dartington’s Theatre Language course (1978-1985). Forty years later in many south London neighbourhoods, where third year students lived and worked on placement, the question still resonates in the continuing permutations of a lay theatre practice first described by Alan Read (Read 1993). The theatre uncovered and propagated by Dartington staff and students at the end of a south London street in 1978 became Rotherhithe Theatre Workshop. Forty-years later this ongoing practice has moved five miles down the road to Deptford, morphing into the work of Entelechy Arts. The encounter between theatre and community and an uncovering of the relationship between theatre, people and place, was at the heart of Dartington’s four-year Theatre Language course, ‘designed primarily for students of theatre who seek to put themselves and their resources at the services of those communities which established theatre does not serve.’ (Dartington College 1976) Colette King, head of the Theatre Department during its inception, held a strong belief in the potential of theatre practice ‘both for the individual in relation to ‘his or her immediate world’ and the society in which the practice is situated (de Wit 2000).’ A huge impetus for the course was ‘the urgent need to address the question – What contribution can theatre practice make to the welfare of the community in which it occurs?’ (King., Hulton and Read 1984). The embedding of this enquiry in and around the southeast London neighbourhood of Rotherhithe over a significant period (the student placement ran from 1978 until 1991) created ‘an opportunity to establish individually and collectively what the practice of theatre could be’ (Read 1993) Within a year-long placement students were given the skills, and critically the time, to live and work in the company of the young and old from a former docklands community undergoing massive social change. Long established kinship networks were slowly being fragmented but there still existed a huge residual sense of belonging that came ‘from knowing and being known’ (Young & Willmott 1957) by so many people in the neighbourhood. Space, time, curiosity and a huge amount of ‘making it up in the moment’ were invested in developing sustained relationships with people for whom the process of making theatre seemed to be a necessary and natural part of their day to day lives. ‘The social spaces in which theatre occurred, the place it took up, that in each and every case needed analysis and continual renewal through theatre.’ (Read 1993). Young people in the neighbourhood acted out their stories in the shelter of the rubbish chutes underneath the tower blocks of the local estate. They had ‘dreaming spaces’ on the L shaped pier jutting out from the derelict riverside space. Older people still hauled themselves onto coaches clinging on to the old works tradition of the ‘beano’ and the wild south London seasonal decamps to the hop fields of Kent. They screamed out their survival of everything that the twentieth century had thrown at them through the raw processes of theatre: telling stories, singing and dancing. Each year they would still organise summer coach trips down to seaside towns on the south coast, still young and wild despite what their bodies were telling them, scouring the pubs for a piano. They’d transform themselves with costumes stuffed into carrier bags, seduce bar staff to sing and kitchen staff to perform impromptu fragments of Shakespeare. They were the curators of wild and wonderful mash-ups. ‘It was only a little bar but we commandeered it. And they all said “Oh it’s the Bermondsey Women.” We sit down quiet for one drink and then, all of a sudden, the piano and…’ (Slater 1985). ‘It’s become clear to me what’s unique, what’s different… With the use of arts in health it’s either come from a biomedical model and considered as therapy, so you have an art therapist alongside a physiotherapist, or an occupational therapist or it’s an educational model and about teaching and you go and deliver a session. This is coming from a completely different model, which is about passion for art. It’s holistic; completely holistic.’ (Ruta 2017). Four decades later there are still direct links back to Dartington’s presence. One of the older residents in the Bermondsey care home, now working with Entelechy’s artists on research and development for the forty-eight-hour immersive theatre work, was the niece of one of the Bermondsey women who worked alongside Dartington students in the 1980s. ‘My aunt was always doing wild things’, she said. And so the ripples continue, with the same irrepressible curiosity, energy and cultural intelligence inform the making of a very local theatre. In his introduction to the Council of Europe workshop on Theatre and Communities Robert Witkin spoke of the point of connection between the individual’s expression of feeling and emotion and the larger structures of collective life; the individual’s ‘personal being and the larger structure of affect which we call community’. ‘Human Communities, unlike those of insects, or animals are not given directly in the genes; we have to make them and remake them.’ (Witkin 1985). Within Dartington’s teaching the emphasis on process, the necessity for a constant making and remaking was most evident in the work of dance artist Steve Paxton and his introduction of Contact Improvisation with its focus on the constant state of becoming –‘the improvisational process of evolving that never really reaches an endpoint’ (Cooper Albright 1997) This practice suddenly suggested that there was ‘no one way to make dance… no kind of movement that can’t be included in these dances…no kind of sound that is not proper for accompaniment. Only the integrity of the performer is at stake, the integrity to do the business in hand’ (Barnes 1993). ‘I look forward to my Tuesdays like you never know how. I say to the doctors, the hospitals, whoever’s doing the appointments: “I’m sorry I can’t have that date, it’s a Tuesday…I can’t have an appointment on that date.” That’s how much it means.’ (Channing-Hamon 2017). Perhaps the legacy of the Theatre Language course, the reason why, forty years later its teaching is still so resonant, is this sense of integrity and authenticity that it invested in its graduates. A new generation of theatre-makers were supported to develop their practice in places and spaces that gave them both the resilience and courage to side-step the transitory fashions of applied practice: ‘Outmoded forms of reference such as ‘political theatre’ and ‘community arts’ limit thought to partitioned realms which have very little to do with the complexity of real contexts’(Read 1993) Students were supported to work within the ambiguity of both knowing and not knowing what they were doing; to have the confidence to see the making of creative choices as ‘stages of an exploration in which the end cannot necessarily be envisaged at the beginning’ (Kent., Ward and Yon 1985). In short it allowed the liberation for a new generation of practitioners to work with vulnerability and uncertainty within a huge range of diverse social landscapes. Back in the Bermondsey Care Home and the wider communities beyond, it is as true for Florrie as it was for her Aunt Nell forty years earlier: ‘the rhythm and modes of expression that many older people have at their disposal destabilise the conventions of a theatre which thinks it knows itself (Read 1993). ‘We don’t have a certificate to say we went to a drama school but in this community, here we are recognised… At our age we take risks. It is stimulating intellectually. All of us are on tablets or pills or injections… Anything could happen to us but we take the risk. There’s a lot of trust. We belong to this body of trust, like sisters to each other. Sometimes you’ve got to take risks for the unknown…We want to be remembered.’ (Wheatland, Sewell, Hunte & Keckwick 2013). Cacioppo, J. T., & Patrick, W. 2008 Loneliness: Human nature and the need for social connection. New York, NY: W. W. Norton. Over four hundred and twenty species of butterfly have been recorded in Taiwan and suddenly it feels as if they are all in the room. A large group of residents from the Da-long Senior Home in the north of Taipei are sitting together in a circle and by some strange alchemy it is as if their hands have all been transmogrified into butterflies. Fluttering wings are leading a mass of bodies into a gentle choreography of stretches, twists and turns. It’s part of a magical workshop led by choreographer Wei-chia su whose work forms part of a wider arts outreach programme run by the National Theatre of Taipei. Witnessing the trust and qualities of listening that are present in the room I imagine that artist and participants have all been working together for months but after the session, I learn that this is the first time they have all met. Wei-chia su talked about his process of paying close attention to the physical presence and qualities of all in the group, subtly changing the form and content of the session to meet the wide-ranging needs of different bodies and personalities. In curating these transitory encounters between exceptional artists and elders, the team at the National Theatre of Taipei are effectively exploring the resonant boundaries between art, performance and care. In the communal space of the care home something raw and immediate was happening: a thrilling and spontaneous encounter between artist and people. I have written elsewhere about the huge synergies between the processes of care and creativity. Both demand a forensic application of both attention and responsiveness. Both need to be delivered with responsibility and competence. At heart both care and creativity share the same principles. A few weeks earlier in Saitama, Japan I had been immersed in ‘Night Never Gets Darker’, a performance work co-created by Sugawara Naoki, an actor, theatre director and certified carer. In addition to his work as a theatre director Sugawara Naoki has applied theatrical techniques and processes to enhance the skills needed for staff teams providing care for people living with dementia. In London, within Entelechy Arts and the Albany’s ‘Meet Me’ programme we have appointed our first occupational therapist to work alongside sculptors, poets, dancers and musicians. In March of this year, Taiwan’s Ministry of the Interior announced that the country had become an “aged society”. This means that (according to the World Heath Organisation’s ageing rate) the country has 14% of the population over 65. Projections suggest that in 8 years’ time this will rise to over 21% making the country (along with South Korea and Singapore) the world’s first super ageing society ahead of Japan and the US. For the arts community to effectively respond to these massive global demographic changes, to effectively support the creative aspirations and access requirements of the new older, old, we will have to imagine new, often hybrid ways of working. And one of the most powerful ways of effecting this must be through an exchange of international experiences and learning. My visit to the Da-long Senior Home was part of a wonderfully crowded two days of visits to arts and older people’s groups in Taipei hosted by the British Council. Hopefully this is the beginning of ongoing conversations between older arts working in London and the artists they work with and artists and people in Taipei. Watch this space. A week ago today eight older performers from Entelechy Arts performed their street art work ‘Bed’ in and around the terraces of Southbank Centre London as part of the (B)old Festival celebrating the work of older artists. The presence of an older woman in a bed in one of the most public spaces at the centre of our city seemed to have created an intermingling of all these domains. For the last couple of weeks the office at Entelechy Arts has, once again, disguised itself as a rehearsal studio as members of our elder’s company prepare for a revival of their live art performance ‘Bed’ for Southbank Centre’s (B)old Festival at the end of the week. My desk is littered with revised and revised, revised rehearsal calls. As a young theatre student I performed in a play staged by a visiting director. Before the start of rehearsals he made a speech about commitment. We were asked to leave all of our day to day pre-occupations outside of his rehearsal room: we had to commit ourselves, surrender ourselves, to the rigour of the empty space. I have actively sought to ignore this advice for all my working life. If taken I’d probably have spent a great deal of time sitting alone in empty studios. For theatre and the arts to have a meaningful relationship with community it surely has to enter into a constant process of negotiation and renegotiation with the experience of the everyday. Hence the constantly re-written rehearsal calls for ‘Bed’. People have hospital appointments, grandchildren suddenly get ill and need to be looked after, plumbers have to be waited in for. People fall down stairs, experience bereavement, need longer than anticipated recovery periods from surgery. All ordinary, everyday stuff for people living in the communities within which we work. Within these carefully negotiated moments in people’s day to day lives, the extra-ordinary process of making theatre transforms itself miraculously into the ordinary; ordinary amongst the litany of all of the other things that give meaning and value to our lives. You could say that this is nothing special. Just a day trip, a day out, a hark back to the old works beano. But somehow this early August day has morphed into a gentle uncovering, an un-hiding of people: the placing back into the public gaze of so many who we just don’t get to see. The very act becomes political: as if we are reclaiming the right to ordinarily inhabit public space, to stitch ourselves back carefully into the fabric of community. The trip to Eltham is part of a suite of Meet Me activities called Meet Me on the Move. For the last year, we have been going out and about on different journeys across the city. To museums and galleries, to parks and open spaces. There are fifty of us on this expedition: (formerly) isolated older people, artists, volunteers, befrienders, project staff; fifty people curious and interested about each other’s lives. Perhaps as we grow older it becomes more complicated to stay ordinary, to be recognized, valued and celebrated for the beauty of our ordinariness. There is so much more planning and careful preparation needed to achieve moments that decades earlier wouldn’t have merited a second thought. The micromanagement of journey planning, risk assessment, of ensuring that there are available and adequate resources in place presents huge and often daunting tasks. Maybe at any age or stage of our lives we want the opportunity to be with people we know, and people who we are getting to know, against different backdrops, in front of different horizons and then for brief moments in time the ordinary becomes extraordinary. When I was 14 my mother was working in the café of the Horniman Museum serving teas. Rosa Dawson ran the children’s room at the museum and asked my mother if I would be interested in helping her at the weekends. It was very interesting. I really enjoyed it. Rosa introduced me to a marionette company. There had some marvellous marionettes and a stage where they used to do plays. I got involved and joined the marionette society. I used to go up to this hotel once a month and we used to show off what we had made. I made quite an impression. They wanted me to go and work the marionettes in their theatre when they went on a tour of Europe because I was so interested in it. But my Mum and Dad said “no” I couldn’t go because they were only gypsies. So that finished that. I would have loved to have travelled with them. They were marvellous, marvellous marionettes. I’ve never seen anything like it before or since. So I went to work in Guys Hospital as a dental technicians assistant. There were four of us girls and we used to do all of the stuff that the students didn’t want to do, making the bites for false teeth. It was an exacting sort of job. My doctor told me about Meet Me because I was so depressed and run down and she recommended I come here. And the social worker tried to get me an appointment to come. That was about four years ago. When I first came it was wonderful because I hadn’t been out to any clubs or anything ever. After my husband died that was it. The first day I came I can even remember I drew a parrot. And everybody was all keen on it and then I drew another bird and then I drew a horse’s head I think it was. Every time I came I did something different which I really enjoyed. We didn’t do sculpting work then it was just painting. The artist Malcolm when he helped me do them. And because I’d made marionettes myself, all those years ago it bought it all back. It was very good. I was up the park and I saw this swan and I thought it would be nice to make one of those. It was sticking the feathers on that was the worst. It was hours and hours to stick them on because they all have to be stuck on individually and you have to get them in exactly the right position otherwise they look odd. You have to cut them and make sure they are on the right side and not the wrong side otherwise you don’t get the shine on them. It takes a little while to work it all out. His neck is twisted because he’s pulling himself out of the water. He’s just about to take off. Its lovely when I finish a sculpture and see the finished product. It gives you great satisfaction. But then it’s sad because I don’t like to really like to finish them. Mixed feelings. Coming to Meet Me has made a big difference to my life. I can’t believe what a difference it’s made. Sitting at home people say: “I bored, I’ve got nothing to do but if they cane to a place like this they wouldn’t have time to think. It’s a pity its only once a week. It would be nice if it was two days a week and a bit longer.